With its doctrine of scrupulous media balance – “they said, he said, we don’t know” – Western reporting on the latest phase in Russia’s relentless imperialist aggression against Ukraine has been as misleading as what has gone before. Even the sight of Russian special forces swarming over three Ukrainian vessels illegally “captured” this week while trying to move in their own territorial waters seems to the Western media no worse than a sign that “tensions are rising” in the area. Then when three of the 24 “captured” Ukrainian sailors are “interviewed” by the KGB (now wishing to be known as the FSB), and admitting on prime-time Russian TV beamed to the world (also illegal) to have been in the wrong, this too is deemed unremarkable. The three hostages confess and regret that they were trying to stage a provokatsia (a deeply Soviet-Putinist word, one of the many which are lost in translation). And our local media seem not to find anything too disturbing in any of that either. In fact, it is not tensions that are escalating but the relentless Russian acts of aggression against Ukraine. 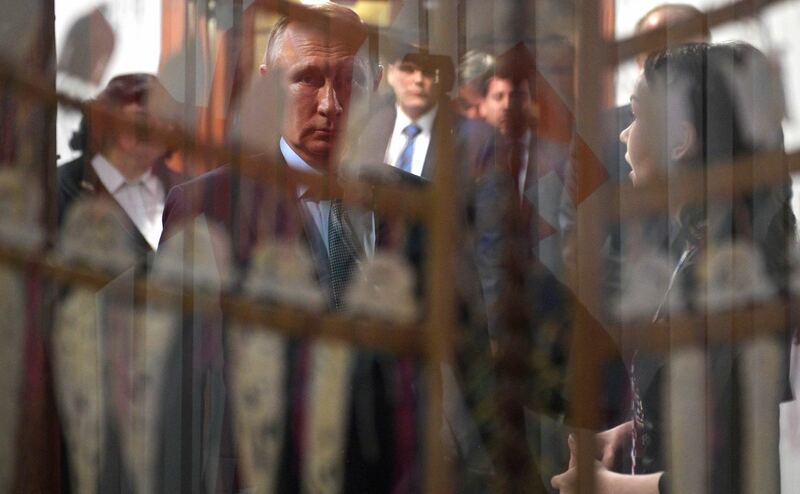 In Kremlin “hybrid warfare” the activity takes place on innumerable fronts at once (from battlefields via banks and cultural exchanges to sporting contests, election-hacking, and trade blockades, to name a few of the multiple theatres involved). The fisticuffs in the Kerch Strait did not begin the day before yesterday. Moscow has been wanting to build the bridge over the strait for a long time, to organically link Crimea to the Russian mainland, and inter alia to make it easier to militarise and resupply the “annexed” territory of Crimea (all totally illegal), and to prepare for the possible seizure of the Ukraine littoral on the Sea of Azov. This will provide an opportunity ­­– as an ill-fated Russian minister told Tsar Nicholas II before the Russo-Japanese conflict of 1904-1905 – for a “small, victorious war”, which would again magically lift Putin’s sagging popularity ratings, just as Krymnash (Crimea is ours) did back when his ratings were last comparably low in 2014. Another important Russian objective in building the bridge was to further the Kremlin’s objective of destroying the Ukrainian economy. With the Kerch bridge at last built (illegally) by a Putin-friendly oligarch, fresh opportunities for economic aggression opened up. The bridge itself was deliberately constructed with limited elevation, which prevents many of Ukraine’s merchant vessels from accessing the vital ports of Mariupol and Berdiansk in the Sea of Azov, north of the bridge. Finding that chicanery useful but insufficient for its purposes, the Kremlin next embarked on a progressive strangulation of much of Ukraine’s external trade by harassing those vessels that were able to pass under the bridge by subjecting them to “customs searches” (illegal), often lasting for days. In addition to damaging Ukraine’s trade and economy overall, this inflicted particular harm on the ports in question. In turn, this would hopefully soften them up and the war-weary population of the surrounding territory for more Kremlin operations aimed at preparing for a smooth take-over of a further large part of Ukraine in the future. Scarcely a whisper of this sustained activity in the Sea of Azov has been making it into our local media; and the West generally has latterly paid less than adequate attention to the ongoing aggression against Ukraine that has cost well over 10,000 lives, many more non-fatal casualties and displaced millions. Moreover, this war potentially threatens a return of a hostile, aggressive, expansionist and heavily militarised Russia to the borders of Europe. The West generally has latterly paid less than adequate attention to the ongoing aggression against Ukraine that has cost well over 10,000 lives, many more non-fatal casualties and displaced millions. Nor is it only a threat to Europe. Russia, and China under their respective neo-Stalinist leaderships are getting closer and closer to a military alliance. They consult regularly, exercise together, including in the Baltic Sea, they cover for each other, lie for each other, veto for each other, and quite possibly plan and time their aggressive moves in close and collusive co-operation. They share a strong hostility towards US power and the liberal rules-based international order. They each aspire to control a large expanse of water, surrounded by many countries with claims of their own, but to which they assert a right of paramount authority. Both regimes will probably have been greatly cheered by the latest pusillanimous response by the hopelessly divided, distracted, and demoralised Western leaderships to an overt military challenge. US President Donald Trump, preparing for another meeting with his greatly admired Kremlin counterpart at the G20 meeting in Buenos Aires on Friday and Saturday, clearly doesn’t want a trivial issue like Kerch to interfere with the important business he wants to transact there. Trump has told the Washington Post he may yet cancel his meeting with Putin. He said the view of his security advisors would be determinative in this decision. But there must be a question mark over how sincere his statement was. The “adults in the room” of the Trump Administration have done a wonderful job, despite intermittent sackings, to keep US policy on the rails. On Russia, the Trump Administration has done better and is still doing better than its predecessor’s administration. Obama made fine speeches, expressed haughty though counter-productive disdain for Putin, and provided substantial non-lethal support to Kyiv. But as President Poroshenko once famously commented when thanking Obama for such a gift “one cannot win the war with blankets”. It remains questionable how much of Trump’s recent vigour in opposing Russia is determined more by his fear of Special Counsel Robert Mueller than his genuine commitment to resisting Moscow. His first move after the mid-term elections was to remove his Attorney-General Jeff Sessions, whom he held responsible for not having closed down the Mueller investigation. In a legally dubious move, Trump then replaced Sessions not by his deputy, Rod Rosenstein, whom Trump would also like to get rid of, but by a ring-in from elsewhere, Matthew Whitaker, who had gone on record repeatedly as an opponent of Mueller and his enquiry. What will we learn, if anything, of what Putin and Trump discuss in Buenos Aires, should the talks go ahead? Will Trump update his counterpart on the future of the special counsel? Would he discuss what possible sackings and new and improved appointments might be made in areas of particular interest, and importance to the Kremlin in a Mueller-free environment? And in what terms at their next opportunity might Putin and China’s Xi Jinping discuss their observations of the West’s response to Putin’s progressive militarisation and privatisation of his Black Sea lake? This article draws on a presentation “Western Strategic Disarray and the Short-term Outlook for Ukraine” delivered at Monash University last month. To really unleash economic growth, Russia would need institutional reforms that take on entrenched interests, rent-seeking and corruption.